The headlines on the 16th of march in most of the Dutch and international press were jubilant: After Brexit and the election of Trump, the rise of populism seemed to be stopped in the Netherlands. 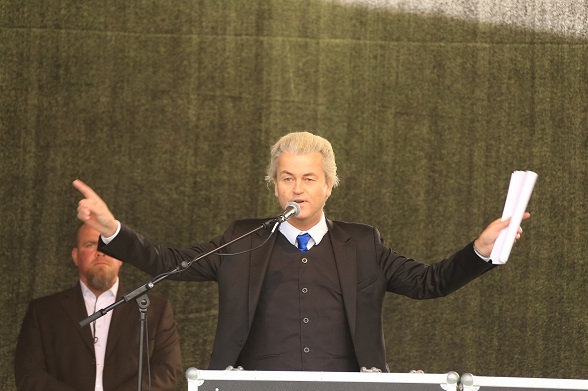 The extreme-right PVV (Freedom Party) of Geert Wilders, after leading the polls for a long time, became the second party in the elections with twenty of the total of one hundred fifty seats in parliament, thirteen behind the conservative liberals of the VVD (People’s party of Freedom and Democracy). This explanation of the elections is a little too plain. As always, elections have a lot more to tell and are not easily captured in one fitting story, especially when this story is based on an international narrative. While the VVD (33 seats) and the CDA (Christian Democrats, nineteen seats) took a part of the poisonous nationalistic rhetoric of the PVV, the left was left behind diminished. The social democrats of the PvdA (Labour) lost 29 of their 38 seats in chamber, after forming a coalition with their biggest rivals of the 2012 elections campaign, the VVD. Source: ad.nl; Caption: Election results, percentage of votes and parliament seats. 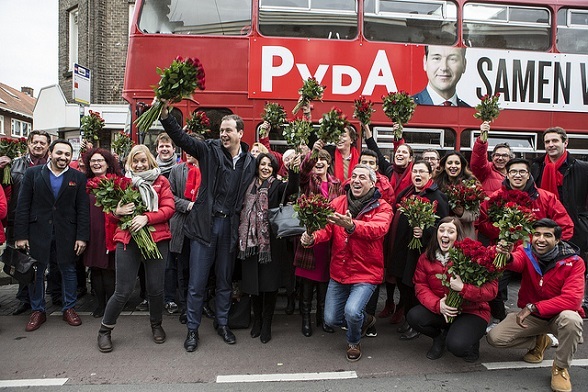 The strange thing is that in these elections no party on the left really profited from the big loss of the PvdA. GroenLinks (Green Left) had a momentum with their young leader Jesse Klaver and achieved a historic result with fourteen seats in parliament, after having four in the 2012 elections. The SP (Socialist Party) on the other hand, went from fifteen seats to fourteen. All in all, the left as a whole now (37 seats) is not even as big as the PvdA (38 seats) was in 2012. Let’s have look into the changing political discourse, in which Geert Wilders is playing a big role. In a recent dutch television program that was broadcasted before the elections, the main theme was the political frame of the PVV and what insiders and ex-parliament members thought the long term goal of Wilders was. In the program they looked into various moments that the PVV, both in local as in national elections, became a big party and had the opportunity to govern. It turned out that every time an opportunity to govern arose, the party either made something unconstitutional part of their electoral platform, such as a ban on headscarves, or said something extreme that would put the whole country in an uproar. The best example of the latest is a speech Wilders gave after local elections in The Hague. In this speech he asked his supporters if they wanted ‘more or fewer’ Moroccans, which led to the public chanting ‘Fewer! Fewer!’. The conclusion after the different elections was always that none of the other parties wanted to govern with the PVV, and that is exactly what Wilders wants. The insiders stated that governing was a risk factor for a party like the PVV, and in different local elections they didn’t even have the intention to form a coalition beforehand. One of the insiders stated that in the end the goal of Wilders is to be the biggest opposition party, block the government where possible, and change the political discourse by saying extreme things about immigrants, the Islam, the EU and so on. And changing the political discourse is what he did. 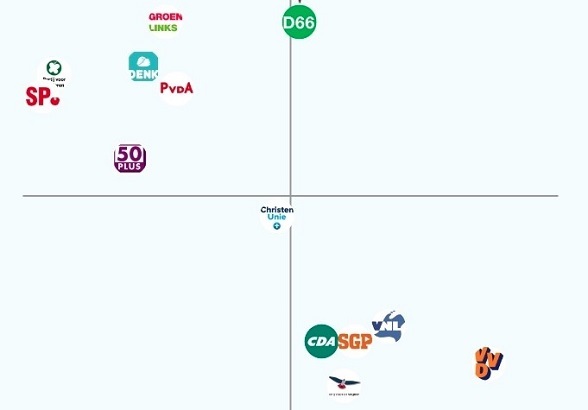 As the PvdD, the Party for Animals, with far-reaching climate actions as one of their pillars, made GroenLinks mainstream, Geert Wilders made the VVD and CDA, afraid to lose voters, shift more towards the right conservative side of the political spectrum. The VVD, although called liberals, only seem to be liberal in the laisser-faire part of the deal. They want the market to take care of things, because they think the market knows best. The funny thing is that this way of arguing protects firms and government from taking responsibility as long as the law is obeyed. The VVD for example thinks that the energy transition should be left entirely to the free market principle . When you see the market as a natural power and the law as the only thing that has to be followed, you don’t have to be bothered by your own moral objections. The campaign of the VVD was based on the slogan “Normaal.Doen.” (Act.Normal. ), and Mark Rutte came with a very specific set of rules about what normal meant for him in a letter he published in various national newspapers. Sybrand Buma of the CDA, normally a party that is settled in the centre, led a campaign with a nationalistic conservative focus as well in which he said that children should be patriotic and sing the national anthem every day at the start of school while standing, and that everyone with a second passport, including the queen Máxima, should hand in their second passport to prove their patriotism for the Netherlands. The problem with this kind of rhetoric is that it creates a division in society with first and second class citizens. As with all elections, I was naively hoping for the left to be big enough to form a centre-left coalition, but in this climate of cultural conservatism and socio-economic laisser-faire, the left as a whole lost enormously. With the PvdA forming a coalition with the VVD for four years and carrying out mostly VVD policy, maybe the voters didn’t believe in the possibility of left policy anymore. The front page of the governmental agreement between PvdA and VVD in 2012 was a picture of a bridge, reflecting the focus of the agreement, called ‘building bridges’. PvdA presented the coalition as a necessity for the country; budget cuts had to be made to guide the Netherlands safely out of the crisis. Not necessarily left policy, one might think, and, as many top economists in 2010 and even the IMF in 2012 said: it doesn’t accelerate the recovery of the economy. More than that, Paul Krugman, nobel prize winner in Economics in 2008, stated that economies have a natural tendency to grow, unless they are slowed down by bad policy. Despite the warnings, budget cuts have been made by PvdA minister of finance and face of the Eurogroup, the ‘pragmatic’ Jeroen Dijsselbloem. The Dutch satirical internet newspaper ‘De Speld’ stated to watch out for Rutte in the negotiations for the new coalition, because the first thing the PvdA almost immediately lost in the last negotiations, was the heart of Jeroen Dijsselbloem. Dijsselbloem, as chairman of the Eurogroup, was very tough on the Greeks, to save ‘our’ money and their economy. In some Dutch newspapers, although most of them were positive and chauvinistic about ‘our’ chairman in Europe, questions were asked about the policy of the Eurogroup: You cannot push for strong budget cuts, and at the same time expect the economy to grow. The paradox of the policy is best expressed on the Dutch website Follow the Money in a conversation with former minister of finance of Greece, Yanis Varoufakis: Greece’s economy has to grow to pay back the loans, but the budget cuts, which come as a condition for the loans, smother every form of economic growth. Dijsselbloem shares the opinion of the VVD about the market as best instrument to take care of the environmental issues. This is just one example of VVD policy carried out by the PvdA, but there are many more. As political analyst of newspaper NRC Handelsblad Tom-Jan Meeus said: With such PvdA politicians, there is no need for the VVD on the long term. The voter decided in a different way; with such PvdA politicians, there is no need for the PvdA anymore. This election loss is a great learning moment for the left. Photo: PVDA (Flickr); Licence: CC BY-ND 2.0; Caption: Party time? So no, the tide of Trump and the Brexit hasn’t necessarily been stemmed. Xenophobia has made significant gains on the 15th of March – be it not through the PVV alone – and it might continue to make gains in the coming future. The fact that Wilders did not win the elections is by no means a reason to sit back and relax. Yet at the same time, Groenlinks mobilized another movement on the left flank, and young dutch people do seem to be rallying behind fresh progressive ideals of equality, inclusion and sustainability. The way I see it, it is way too early to cheer, but there is a glimpse of hope. The next coalition will have at least two parties who want take serious actions to fight climate change (D66 and Groenlinks or Christian Union) and I have hopes that the coming years GroenLinks will continue to fight for the values that matter the most: less inequality, an inclusive national story, focus on European partnership and fighting climate change. Peter Wansink is from the Netherlands and lives in Utrecht. He studied Journalism and Political and Cultural History. He will resume studies next year.